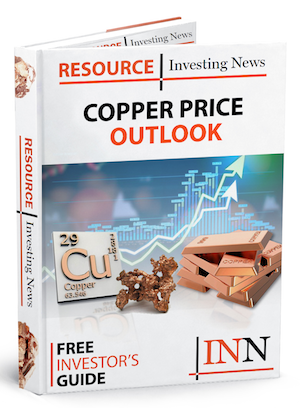 The copper story is “incredibly bullish,” says Leigh Goehring in this interview. As weak supply and strong demand collide, prices could climb as high as $7 to $10 per pound. Copper is currently just over $3 per pound, but Leigh Goehring of research firm Goehring & Rozencwajg believes prices could rise as high as $10 during this cycle. In an interview at the recent Mines and Money conference in New York, Goehring explained that this bullish forecast stems from price action that has taken place in previous bull markets. “We basically went from a bottom of about $0.60 reached in 2000 to a top of about $4.10 reached in the beginning part of 2006. So in a five-year period you basically went up four or five and a half times the price,” he explained to the Investing News Network (INN). Watch the interview above for more insight on copper from Goehring, plus additional commentary from his partner Adam Rozencwajg. You can also read the transcript below. INN: It’s our first time speaking, so I thought you could begin by telling me a little bit about yourselves and about the firm. LG: Goehring & Rozencwajg is a firm that was established about two and a half years ago. I’m Lee Goehring, and I established the firm with my long-term colleague Adam Rozencwajg. It is a firm that’s dedicated to researching and investing in global commodity markets. INN: We’re here at Mines and Money in New York. Earlier today, Leigh, you gave a talk on copper. For those who might not be aware, how have we seen copper perform so far this year? And has its price movement been in line with your expectations? LG: Copper had a very strong year in 2017. And in the very beginning part of January, it hit a price of about $3.25 a pound. It has pulled back and actually has been one of the weaker metal stocks this year. However, I should point out that the weakness that we’re seeing now is — we believe is nothing more than a pullback in a very large, multi-stage bull market that is going to take place in the next five years. INN: Yes. In your talk, you gave quite a long-term perspective on the copper price. Can you briefly go over what has led us to this point? LG: Of all the metals we follow, copper, we believe, has the most interesting and best supply/demand profile of any metal market out there today. What’s going to happen in global copper markets is that incredibly strong demand … will be driven by two forces. One will be the desire to invest in renewables, because remember, renewables require a lot more copper intensity in their investment than standard hydrocarbon fuel plants. I’m talking about wind and solar farms here. That demand will be layered on top of traditional very, very strong demand that’s going to come from basically the emerging markets — not only China, but India, Malaysia, Indonesia, the Philippines, Vietnam. Each of which is entering their period of very rapid and intense copper consumption. So you have very strong demand, and on the supply side we are running into long-term structural [supply concerns]. We have a depletion issue in the copper business … we basically use, we calculate, about 500,000 tonnes of copper supply a year to depletion. And the … very large, what I call mega-projects, coming online in the next five to seven years are few and far between. So we believe that you will have very, very strong demand that’s going to basically collide with very, very weak supply. It’s an incredibly bullish story. INN: Further to the supply side — so we’ve got supply actually dropping, what about grades? What are we looking at in terms of grades right now? LG: One of the interesting things is that … when I mention depletion, one of the easiest ways to measure that is the drop of the head grade. That is the amount of copper that’s contained in the ore that’s actually mined and then put through the mill. What we’re seeing is, we’re seeing about a 2-percent drop in head grades per year over the last five to seven years. That’s accelerated from about a 1-percent drop that we saw from 2005 all the way to 2012. And literally back in 2012 we were mining on a global basis, we calculate, copper with about a 0.9-percent head grade. Today we calculate you’re down to about 0.67 [percent] or something like that. It’s been a significant drop and that head grade drop is dropping by 2 percent per year. 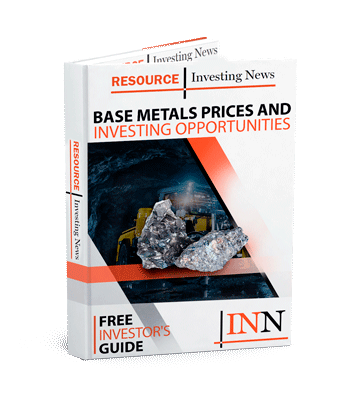 INN: Looking a little more closely at demand, at this conference, copper has been designated an “old-school battery metal.” To what extent can investors expect battery demand to drive copper prices in the years to come? You talked a little bit about that, but let’s hear some more. AR: Sure. This is Adam Rozencwajg speaking now. The big demand push for copper as it relates to batteries won’t necessarily come from the batteries themselves as opposed to cobalt or lithium, which will actually go right into the batteries. But rather, it’ll be the … larger push of electric vehicles and renewable power. An electric vehicle is three times more copper intensive than an internal combustion engine. And as Leigh was mentioning earlier, renewable power sources could be 30 to 40 times as copper intensive as a traditional gas or coal plant. So as we begin to make a push — and we clearly have a strong government and societal desire to move towards a certain amount of EV penetration backed by renewables — that’s really going to drive the impact on copper. LG: Charlotte, there’s an irony in here that they say it’s an “old” battery metal, but it’s really probably the greenest of all metals that there is. INN: So we’ve got all of these supply and demand factors adding up — what is your prediction for prices? Where are we going to see prices go? Do you have a specific outlook? LG: Pricing is always difficult, but if we’re in a real bull market — if you sat through my presentation, I talked about how we really turned bullish on copper markets back in 2000. At the time, the copper was probably $0.75, and what happened in that bull market cycle? We basically went from a bottom of about $0.60 reached in 2000 to a top of about $4.10 reached in the beginning part of 2006. So in a five-year period you basically went up four or five and a half times the price. I wouldn’t be surprised if something along that magnitude happens in this bull market. We started to hit the bottom a little below $2 back in the first quarter of 2016, so I wouldn’t be surprised — a target price would be anywhere between $7 to $10 in this cycle. INN: It sounds like there definitely is an investment opportunity here. Should investors be considering stocks? And if so, which ones? What’s the best way to invest in copper? LG: There is a copper stock ETF out there that I believe that you can invest in. I think that would be one of the easiest ways to do it, you wouldn’t have to be involved with all the individual research that’s required for all these names, which have all sorts of geological and national risk associated with them. So that’s what I would recommend. I do definitely like the copper equities, I think that they will be the best performers. But I think the copper stock ETF would be the best way for an individual investor to play it. INN: And now is the time? LG: I think now is the time. INN: You came here to talk about copper, but I know you’ve got extensive knowledge about the resource space as a whole. What other commodities do you believe have potential in 2018? LG: I think that the most interesting market for the rest of 2018 is going to be global oil markets. Back in January of 2017, we published a big piece outlining our view that we’re going to hit $100 oil in 2018 at some point. We were called crazy, a lot of people ridiculed us. We had a lot people say we didn’t know what we’re talking about. But it’s interesting that Brent right now is closing in on $80 already. The oil market is a market that’s classically out of balance. Demand is running about 600,000 to 700,000 barrels a day greater than supply. OPEC seems determined to keep their production cuts, but that’s becoming a non-issue as they’re falling so far behind now that even if they were to reinstitute all the cuts made in 2016, the oil market would still stay in deficit. So we believe that given the supply/demand fundamentals, the fact that we keep drawing down inventories, which we’ll do through at least the next six months, a $100 oil price is still within our realm of possibility, and we think that oil-related equities offer tremendous opportunity here. INN: Are there any other final points that you would leave investors with for this year? LG: I think we made a classic cycle bottom in all commodities back in the first quarter of 2016. And the pricing of commodities vs. financial assets has reached extremes that you’ve only seen a couple of times in the last hundred years — back in the late 1960s, early 1970s and again back in 1990 to 2001. Both were … excellent times to be an investor in the commodity space, and we believe that investors are being given that opportunity right now, today. Securities Disclosure: I, Charlotte McLeod hold no direct investment interest in any company mentioned in this article.